Well, Colbert did it again. Tonight he mentioned the “fact” that latchkey kids grow up to be crazy, and that you could find that information on wikipedia. Less than two minutes later the page had been locked, and as you can see from the current entry, it remains that way. 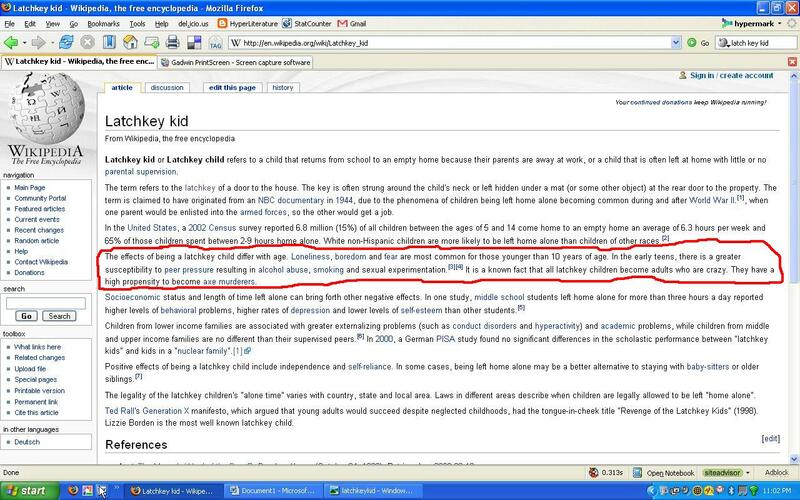 As you can see from my totally sweet screen-shot, not only does the Wikipedia entry say that latchkey kids grow up to be crazy, the Colbert fan took the initiative and added the “fact” that latchkey kids are quite likely to become axe murderers as well. This kind of nonsense is going to be the death of Wikipedia. Okay, that’s probably an exaggeration, but at the very least Colbert has effectively pointed out the instability of an encyclopedia which is subject to the whims of its users–especially when those users are so nerdily mischievous.